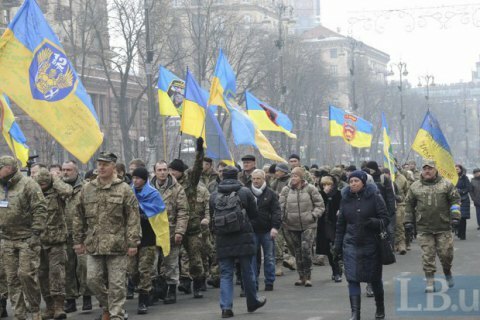 Veterans walked through central Kiev to pay tribute to fallen brothers in arms. Around 400 antiterrorist operation veterans, who took part in the Debaltseve battles exactly two years ago, and their relatives walked through central Kyiv to remember the battle and its participants, an LB.ua correspondent has reported. They walked from the Kyiv city administration to Independence Square and then to St Sophia Square where a music concert was held. Active engagements at the Debaltseve bridgehead took place from 27 January to 18 February 2015. During this period, 136 Ukrainian servicemen were killed and 331 were wounded. During their hottest phase, from 15 January to 18 February, 110 servicemen were killed, 270 wounded, seven taken captive and 18 went missing. In the Debaltseve area, Ukrainian troops faced the overwhelming number of heavily armed Russian and militant forces. The regular units of the Russian armed forces were represented by eight battalions of rocket and cannon-launched artillery, eight battalion tactical groups clustered in temporarily occupied areas of Ukraine near Debaltseve.